A Great Good Saturday Morning to Everyone! I am honored to announce that the Design Team at Our Creative Corner have chosen me to be Guest Designer for their challenge this week. Over the last couple of months I've won a Top 3 Award and Top Talent Award. I say this to encourage you all to hop over and participate in the fun challenge this week. All levels of expertise are welcome and the Design Team always have a wonderful array of samples to inspire you for the fun challenges they set each week. When I read the email with the prompt for this week Fabulous Floss, Spirelli immediately came to my mind. I have been wanting to try my hand at this technique for quite some time but just couldn't decide what kind of a card to showcase it on. Since Spring has sprung I decided on some pretty pink flowers. I used the 1 3/4" scallop from my Spellbinders scallop circle die, but most any scallop punch will do or you can even download some spirelli patterns and cut them out by hand if you search around on the internet. With all the neat tools around these days there aren't too many of us hand cutters left. I do love my Big Shot and dies, but the two smaller flowers and the little bees are hand cut. I had a couple of colors of shiny pink embroidery floss which I split to one strand and wrapped between the scallops then added the brad for the center. 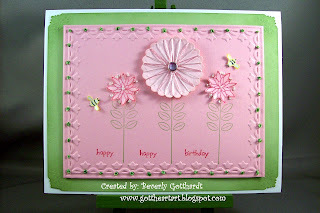 After I ran the darker pink base through the tulip frame embossing folder and finished with all the french knots, I couldn't resist adding a couple of little visiting bees and a Happy Birthday sentiment. We've got quite a few family birthdays coming up in May so I'm getting a jump start on my birthday card stash. It's been a pleasure bringing you my Guest Designer take on this fun challenge. I hope you all will hop over and join in so we can see what ideas you come up with to dazzle us with Fabulous Floss. Supplies: White Card Blank 5" X 6 1/2" Halcraft, Papers: SU-Certainly Celery, Pink Pirouette, Blushing Bride, Whisper White, Stamps: SU-Sweet Summer, Happy Moments, Inks: SU-Pear Pizazz, Blushing Bride, Melon Mambo, Daffodil Delight, SU Textured Impressions Framed Tulips, Spellbinders Nestabilities Classic Scallop Circle Lg., SU Pretties Kit-brad, DMC Embroidery Floss, Fiskars Decorative Corner Punch, SU dimensionals, glue dots. Amazing! I love your Spirelli, as well as the sweet French knots. So glad you could Guest Design with us this week at Our Creative Corner! I am really loving this piece, Beverly! The color combo is so sweet and you did amazing work with the floss! The Spirelli is wonderful but what I really love is the french knots all around the flower and border. I'm so glad you mentioned them in your post because I didn't even realize they were there. I thought it was tiny beads. But when I zoomed in on your card, wow! They are so cool. After many years of lying dormant, it was a pleasure to have my embroidery needle and floss out again. Hope it was for you too! 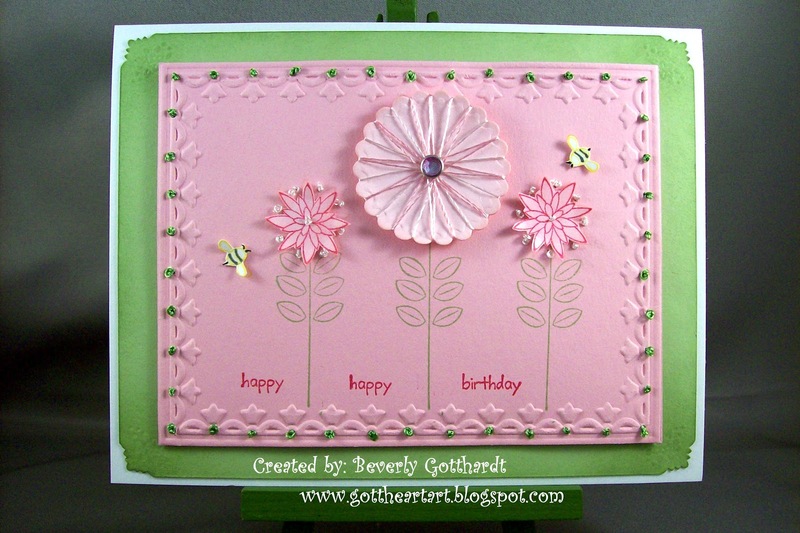 This is really beautiful - what a wonderful technique to use on cards! Your flowers are so pretty. We are very lucky to have you as a participant and a guest designer! so pretty! It was so great to have you join us this week! Love this so much Beverly, all those french knots...WOW!! Awesome challenge card! Thanks so much for joining us as a guest designer this week on the OCC! !